Last week, the concept of a hallel, a prayer about the exodus of Israel from Egypt was introduced. Psalm 114 is called the second “Egyptian hallel. ” We are not sure who the psalmist was or when it was written. We know the reason for its writing, however. It was to remind people what God did when He led His people from Egypt, freeing them from slavery. We need to know what verse 2 means in order to give the Psalm a date. If Judah and Israel are countries, then it means the psalmist wrote it between 950 and 650 B.C. If Judah and Israel are the people, then the date could be earlier. This translation makes them places. But in verse 1, Israel means “the people of Jacob”. This is another name for the Jewish people. Therefore, we are not sure of exactly when this psalm was written. The Psalm is restating what happened when the people of Israel as they left Egypt. God led them to the Promised Land, (verse 2). God led them through the Red Sea, which became dry for them, (verse 3). 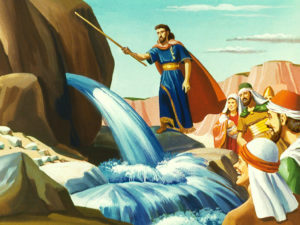 God led them over the River Jordan. It also became dry for them, (verse 3). Mountains and hills like Sinai seemed to jump like animals, (verse 4). God gave them water from the rocks in dry places, (verse 8). To understand this Psalm we first must acknowledge God’s power and goodness in what he did for Israel,. It will apply to that much greater work of wonder, our redemption by Christ. The purpose of the Psalm is to encourage people to trust in God in their distress. When Christ comes for the salvation of His people, He redeems them from the power of sin and Satan. Redemption then takes on a meaning: Christ separates us from an ungodly world. There is no sea, no Jordan, so deep, so broad, that when God’s time comes, God’s people can be divided and driven back. This applies today to the Christian church in the world. At the presence of our Lord, not only mountains, but the earth itself will well tremble. As the Israelites were protected, so we are provided by miracles; such was that fountain of waters into which the flinty rock was turned, and that rock is Christ. The Son of God, the Rock of ages, gave himself to death, to open a fountain to wash away our sins. We do not need to fear that any blessing is too difficult to expect God’s love, only the sinners should fear God’s just and holy judgment. The Church is in God’s capable hands. What are the Old Testament miracles that you find hard to believe? Why? What is it about the human mind that makes is difficult to accept them? Why is it important to embrace the shear power and strength of God? It seems a struggle for modern society to embrace God in that way, what do you think those reasons are? How can we as Christians help each other with understanding the supernatural powers of God? In these verses within Mark, you find a short account of the resurrection and ascension of Jesus along with the joys and triumphs which it gives to all believers. Christ’s resurrection is confirmed by an angel to the women that came to the grave to anoint him (v. 1-8). His appearance to Mary Magdalene, and the account she gave of it to the disciples (v. 9-11). His appearance to the two disciples, going to Emmaus, and the report they made of it to their brethren (v. 12, v. 13). His appearance to the eleven with the commission He gave them to set up his kingdom in the world, and full instructions and credentials , (v. 14-18). His ascension into heaven, the apostles’ commitment to their work, and God’s acceptance of them in it (v. 19, v. 20). Why do you think that Jesus didn’t just wait around for the disciples to show them He was alive – there was an angel instead as a messenger? What type of pressing business do you think Jesus went on ahead to Galilee for? Why would history have women discover that Jesus had risen before His own disciples? Are women different in a way that is more accepting of Jesus? If God would have arranged history so that women had a dominant role within the miracles of Easter, why do you think so many “religions” exclude women from the taks of ministry? The miracle of the resurrection is the most amazing miracle in recorded history. What makes is so hard for some to believe?